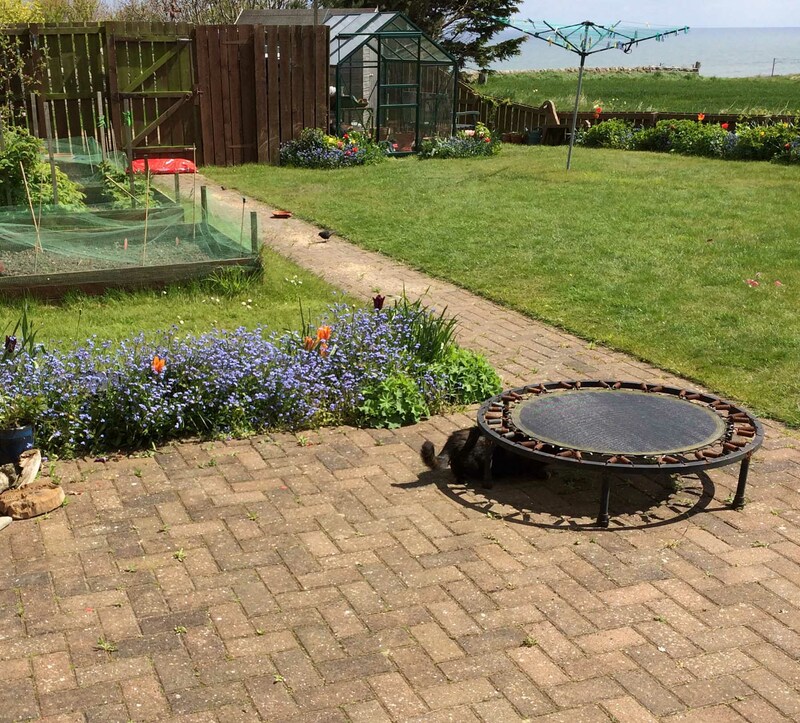 There are two new cats at Seaview, Eggy (short for Eglantine) and Ilsa. They have come from a London home. There they had a cosy little two-up-two-down terraced house with a square patch of a courtyard garden in the busy, bustling world of north London. 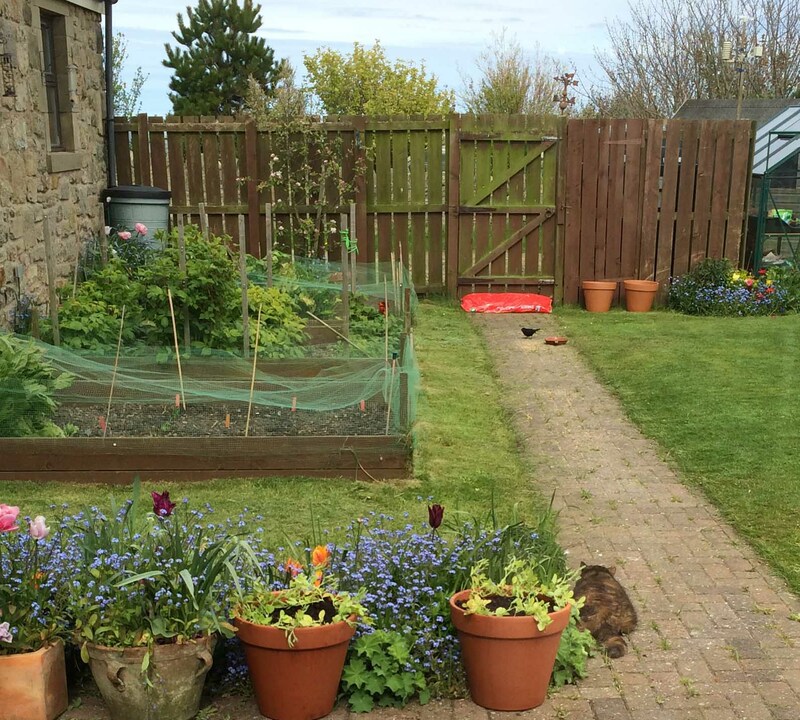 For a variety of complicated reasons, that home had to be sold, so these little kits found themselves in need of a good home and a garden – so they’ve come north! They travelled up by train in a sort of push-chair affair, and, looked so spaced out when they arrived. Where were they? Who were all these new people? Another cat? 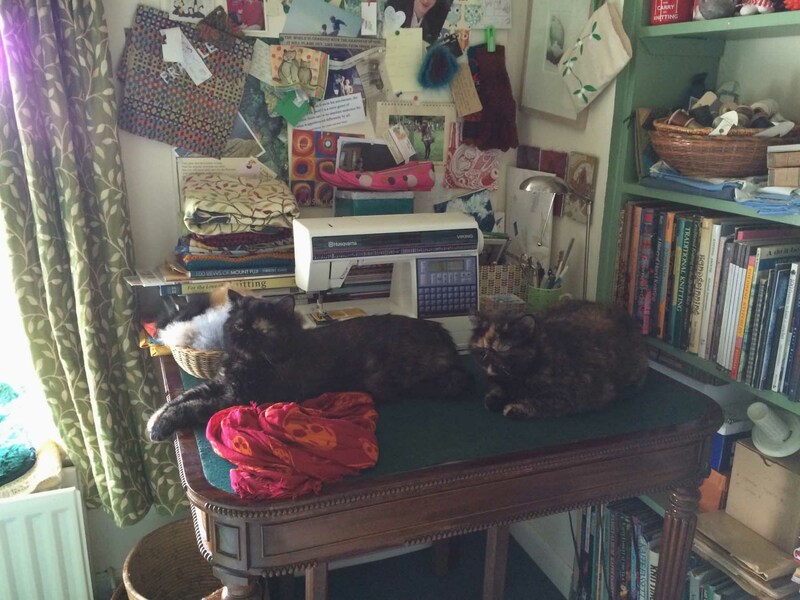 To help them settle in, we shut them into my Woolly Room (big sacrifice on my part) and that has remained their bedroom and bolthole ever since. 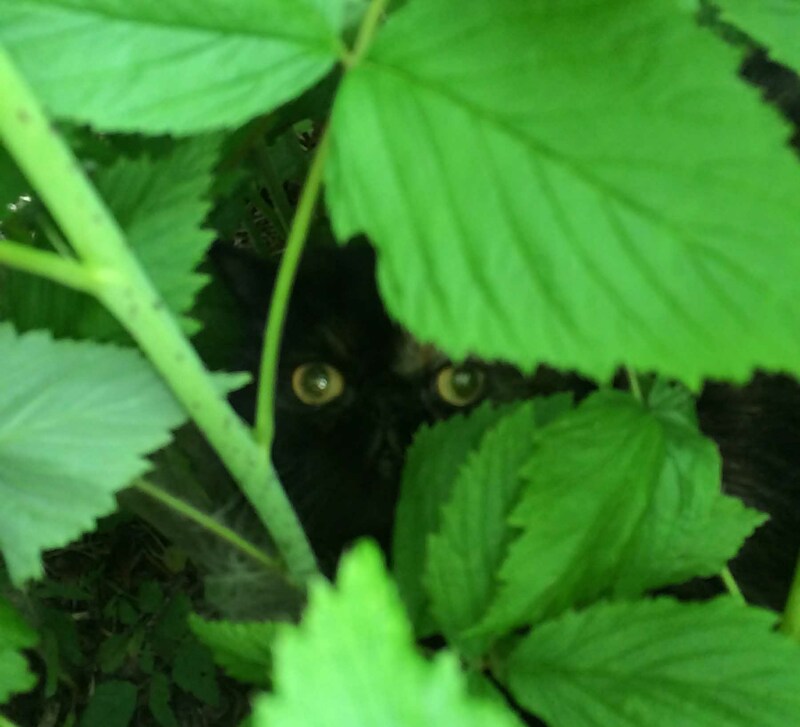 In the photo below Eggy is on the right (she is darker with a light patch over one eye), and Ilsa is crouching down on the left. Of course, we already have a cat. Poe is a lovely ancient family friend who has been with us since she was a kitten. She’s just celebrated her 19th birthday, and if you haven’t met her before, you can read about her here. Poe isn’t a well cat – not surprising considering her age. She has serious heart trouble (for which she takes regular medication), eyesight problems, very reduced hearing, and is almost definitely on the way to some sort of dementia. We sometimes find her sitting looking lost, facing the wall. She is losing weight. 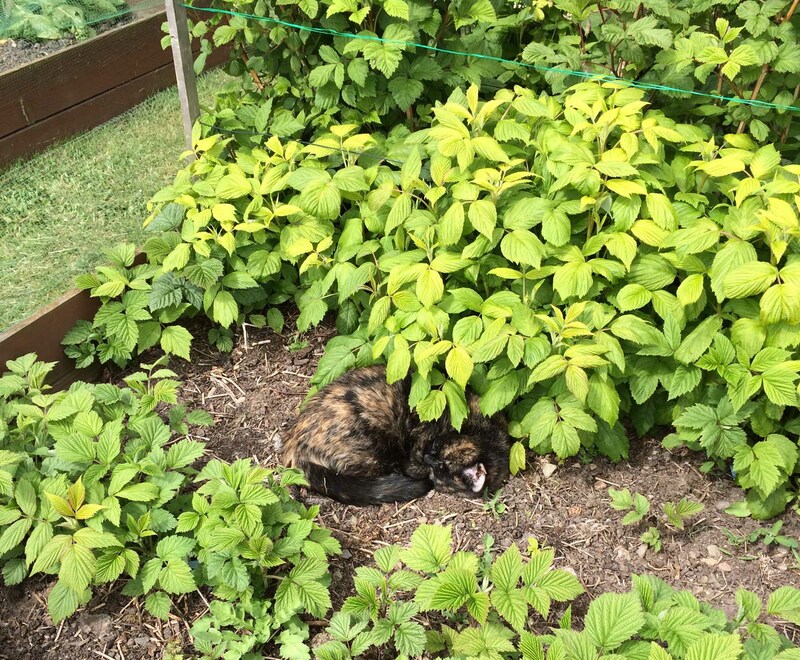 So Poe sleeps most of the day, either in the garden when it is fine (preferably the raspberry bed as below), or on her favourite sofa. And we have recognised that we are probably supporting her in her last year of life. When we invited the new kits to come and live here, we did consider Poe’s health, and the adjustment she would have to make in her very old age to having two new cats on her territory. We discussed with our very understanding vet the possibility of having Poe put to sleep. This was a good move. She was able to reassure us that given all of Poe’s health problems it would not be unreasonable to bring an end to Poe’s life. With that reassurance, we somehow felt much more confident to accept the new kits. We bought a new litter tray for the kits, set up their own feeding station (both in my sewing room) and invested in expensive Feliway cat pheromone diffusers. The kits settled in to their new upstairs home, and we thought we’d take it slowly, let them live upstairs for a bit with Poe downstairs. But the first night, the little curious kits pushed down the barricades we’d set up, and there they were on the stairs! Then Poe happened to be passing … and, oh dear! The look of horror on Poe’s face! If cats could speak …. 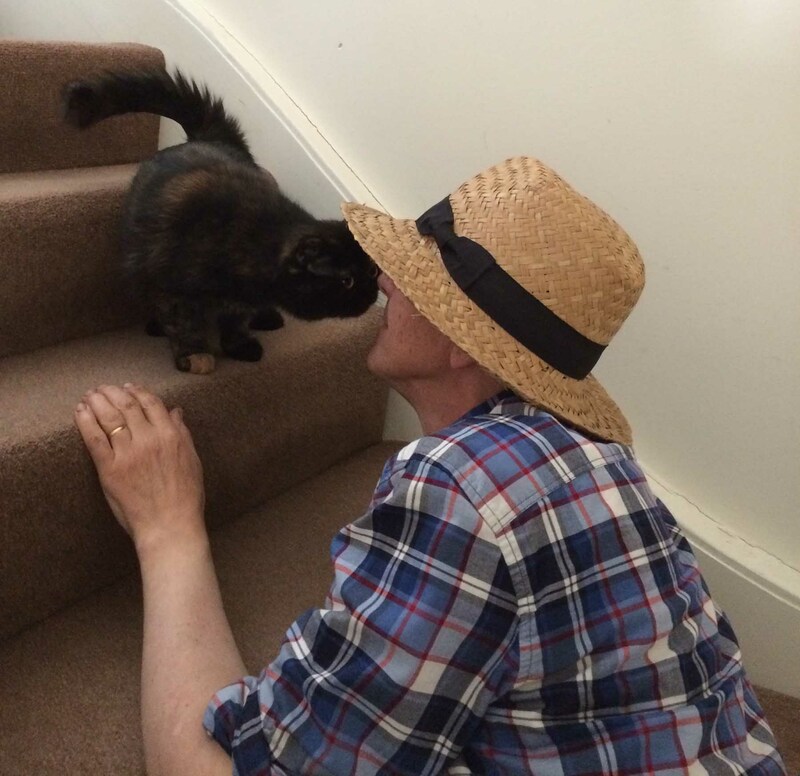 Perhaps that’s why it took so much persuasion to get the kits to come further downstairs … New friendships had to be made. Trust had to be earned. They explored all of Poe’s territory. 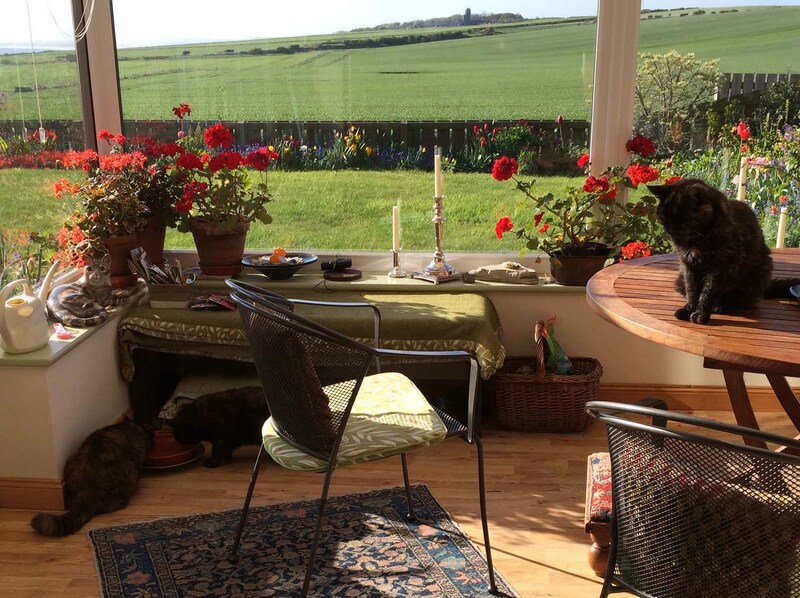 The food bowls … Her conservatory … Poe’s expression (on the table) says it all. I don’t plan to share this at all! The kits pretty quickly realised that Poe could get into a further world that they were at present barred from. How did Poe do it?! 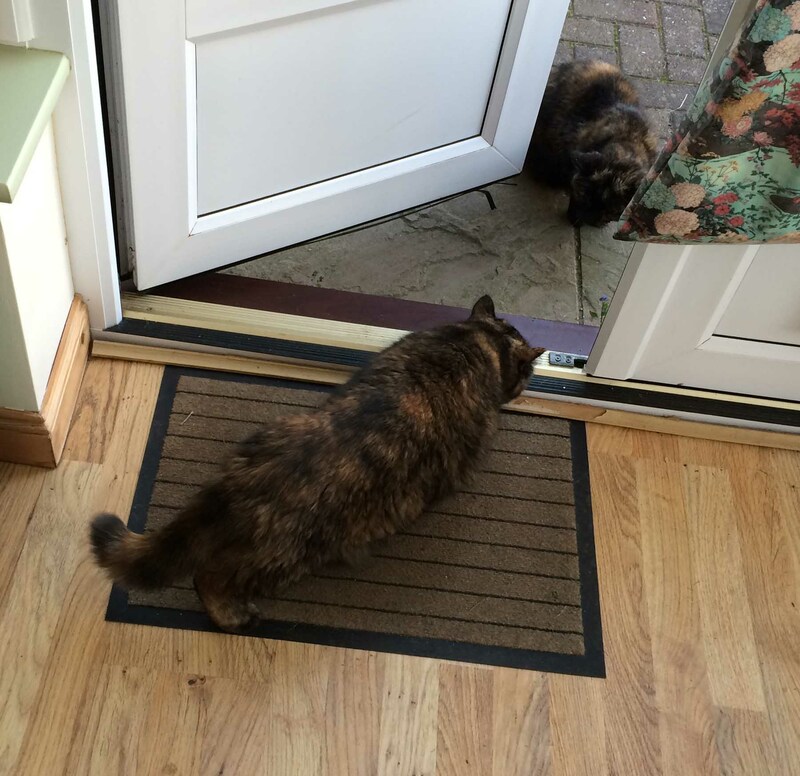 When presented with an open door, they were very wary. 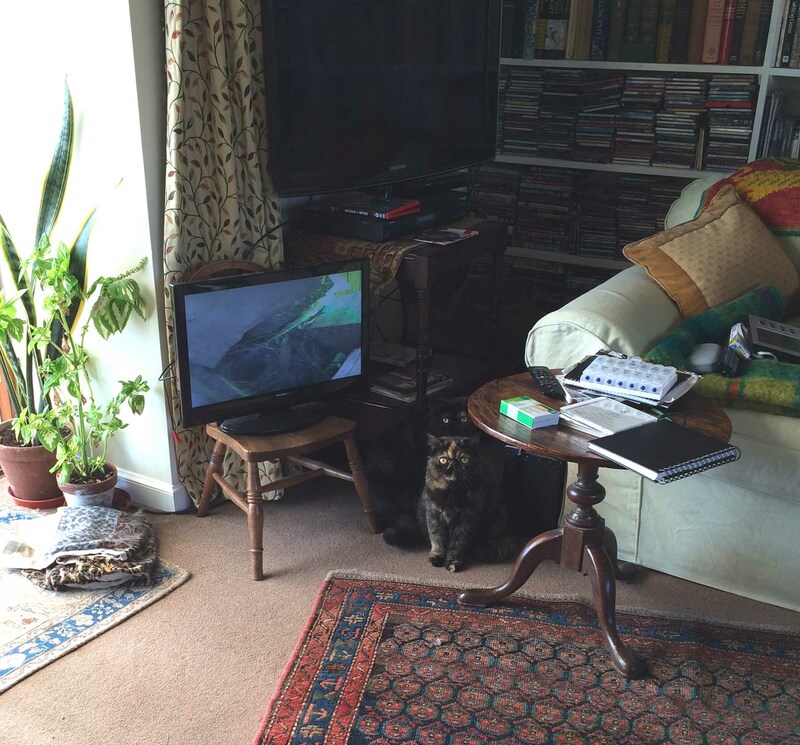 Note Poe watching superciliously. 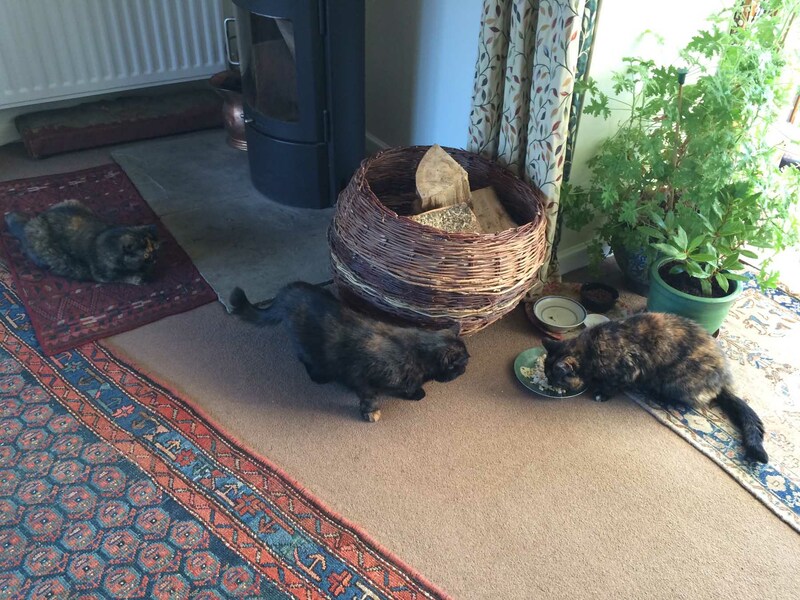 There were fascinating encounters – or non-encounters – as elderly Poe failed to realise the kits’ presence. Perhaps Poe was just enjoying the fuss we all made of her too much to notice Eggy hiding under the bench. 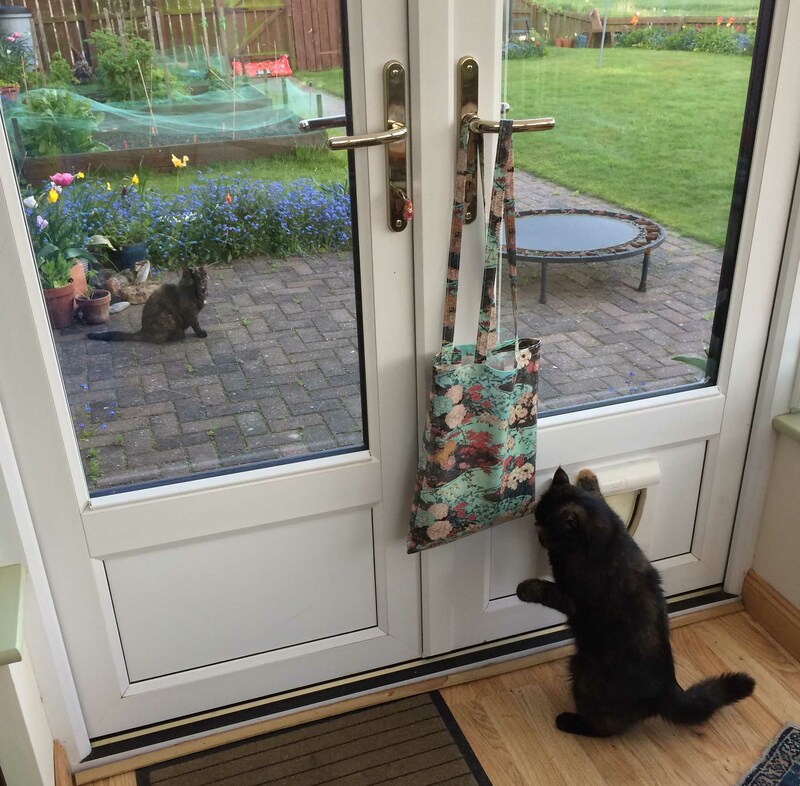 The kits certainly took the outside world very cautiously that first weekend. They’d known outside, of course, in their London garden – but what was that compared to the huge Northumbrian spaces and skies. So both kits went very cautiously, looking for safe hiding places wherever they could. The real magic for the kits is, of course, the birds. 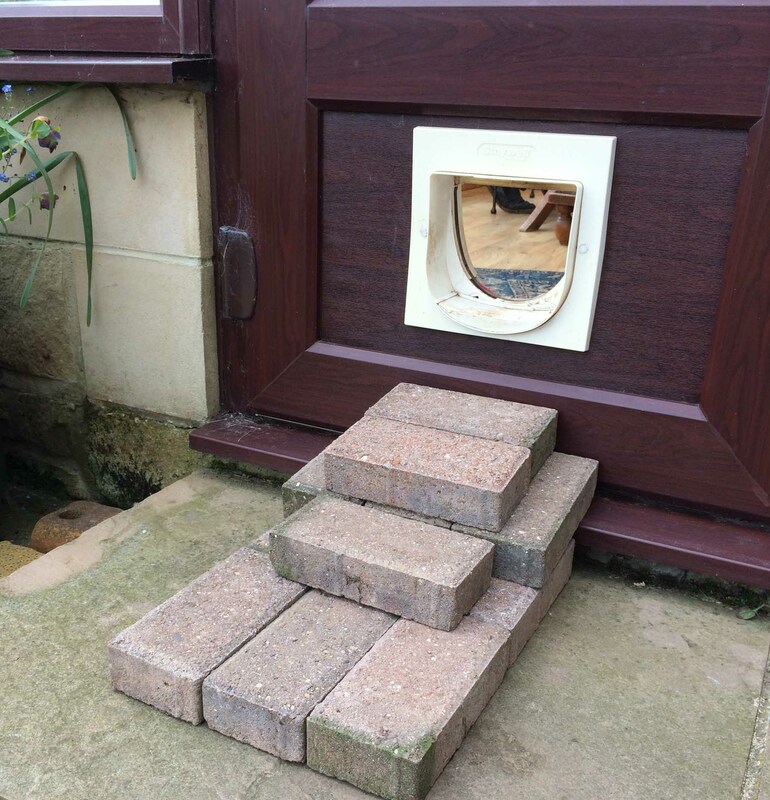 We have bird feeders on the house wall, but also put grain on the path for those birds which prefer to eat this way. Ilsa will spend hours flattened like this, watching and hoping. I feel uncomfortable because we love the birds, but cats are genetically programed to catch birds, and we just have to accept this is what the kits want to do. 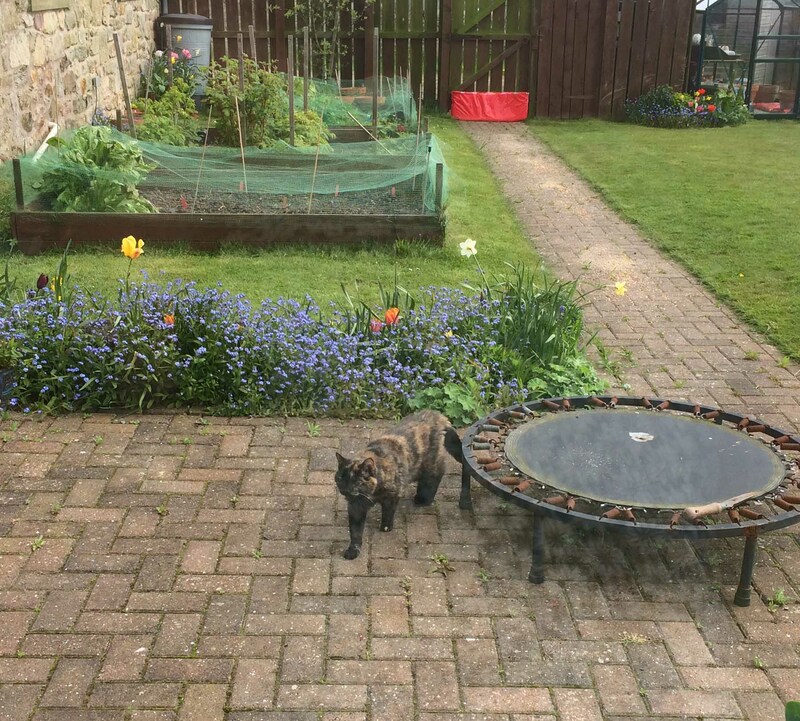 Even though the kits have got better positions now for bird catching (they’ve moved to the raspberry bed), they still haven’t caught anything. I’m not sure they will – they aren’t exactly fast-movers. Yet. Eggy is a bit better at finding a good hiding place. All sounds well and good, doesn’t it? Well, the truth is it wasn’t. Ten days in we were exhausted with monitoring the situation and trying to manage Poe and kit meetings. 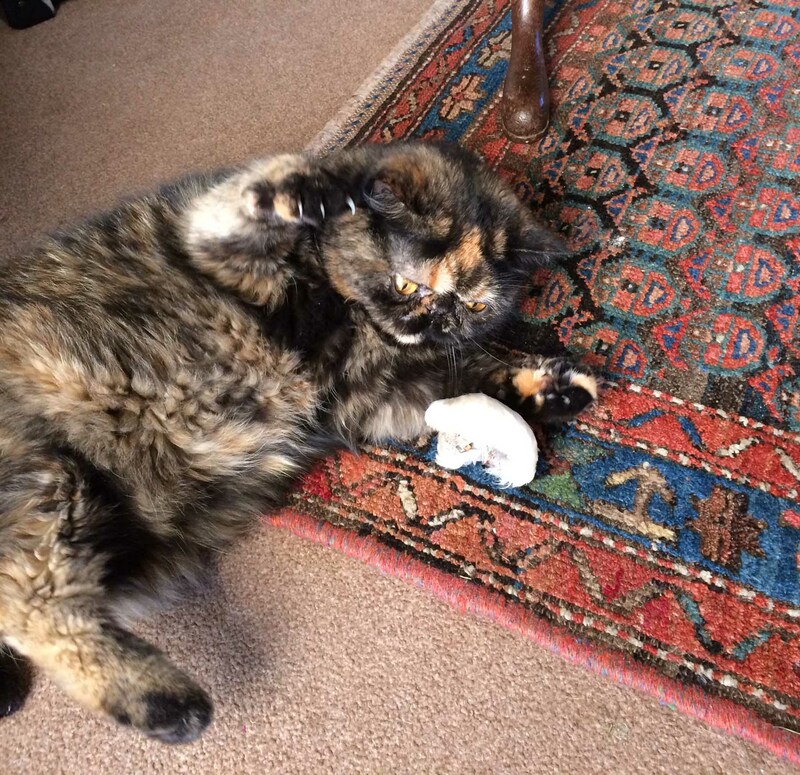 Poe seemed to be getting thinner and thinner – whether it was just the contrast of the fat little kits that made us more aware of her loss of weight, or whether anxiety was genuinely causing her to lose weight, we couldn’t be sure. She certainly seemed to be eating as much as ever. But she looked so thin – her sides are almost concave. So as we approached their second weekend here, we were thinking that it would be kindest to take Poe on that fateful vet trip next week. But something changed. Suddenly, things jelled. I think two things happened. Firstly, the kits genuinely made our house their own home. 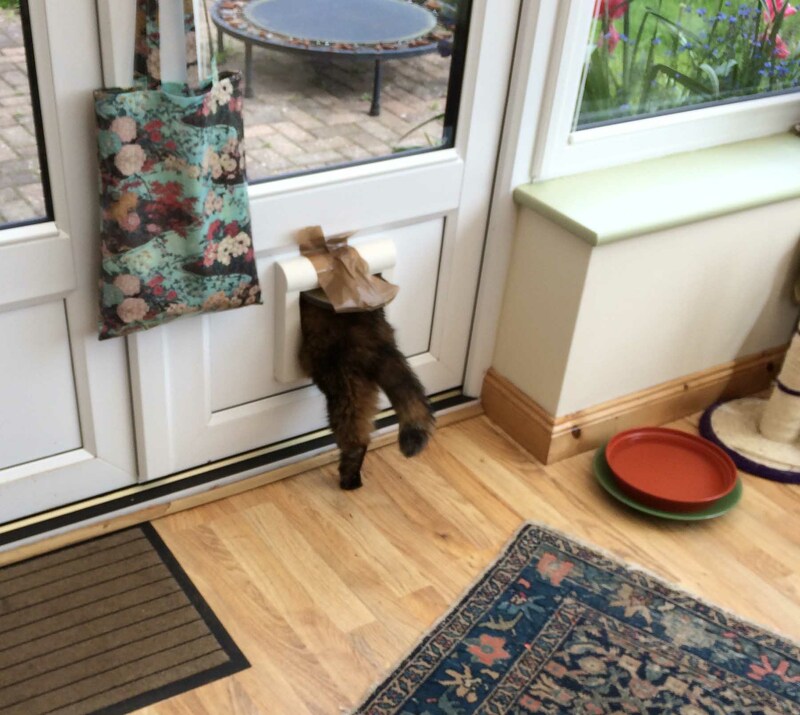 Because they are differently sized from Poe, they couldn’t get through the catflap without help, so we helped them … And a little gaffer tape came in useful. Secondly, I think the antagonism between Poe and the kits settled down. It is now benign teasing of Great-Aunt Poe by her bumptious nieces. They are endlessly inquisitive, and cannot resist checking her out, but she, from her superior age and height, can just let it pass – mostly. She still hisses, and has been known to biff them if they annoy her too much. It helps that we separate the kits from Poe at night so that nobody can upset anybody else when we are not around. The new kits are the very sweetest of sweet-natured cats, and they give us hours of entertainment. For all that it is hard work having three unsettled cats, it is very funny. 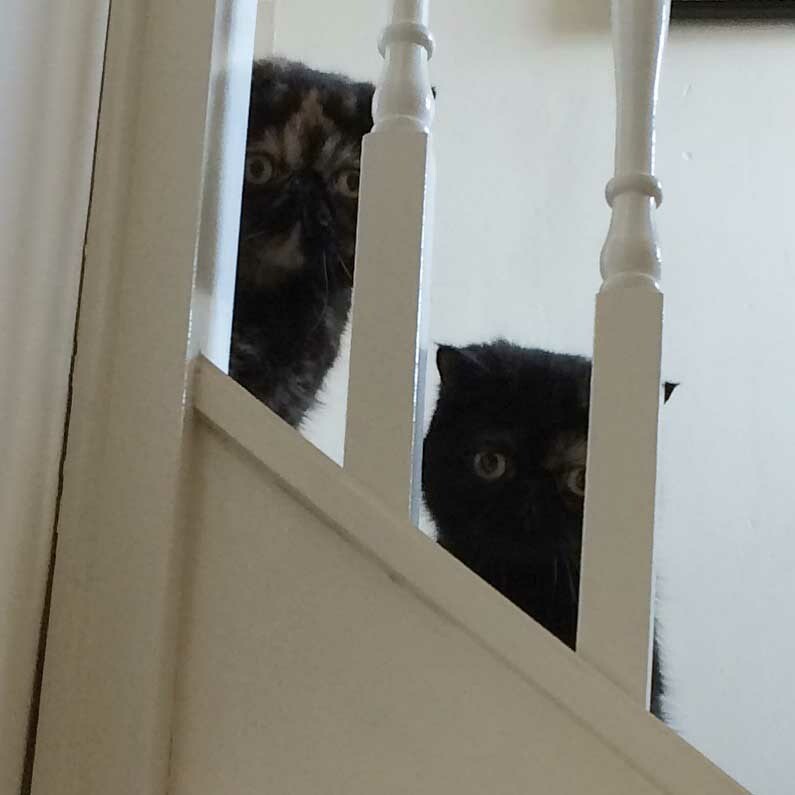 Look how guilty they seem after we caught them watching birdtv! 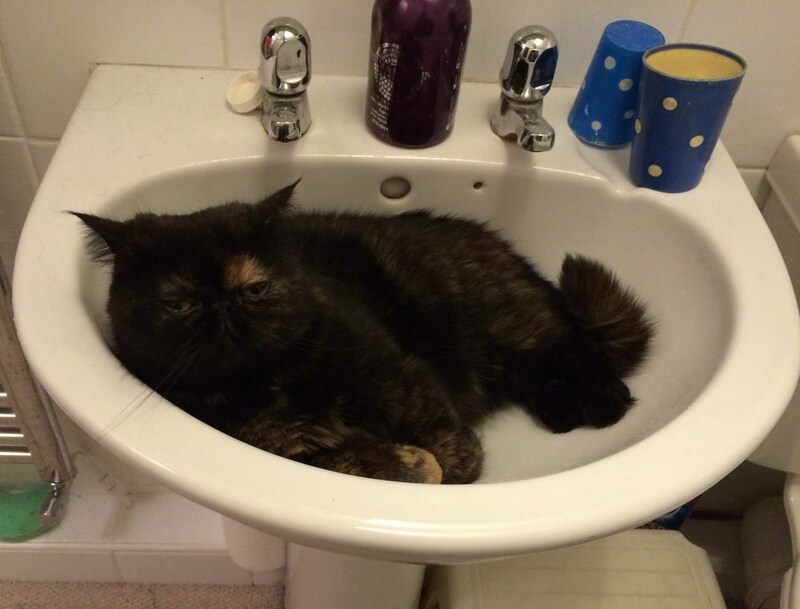 Oh Eggy, you know just how sweet you look in the sink, but how am I to clean my teeth? 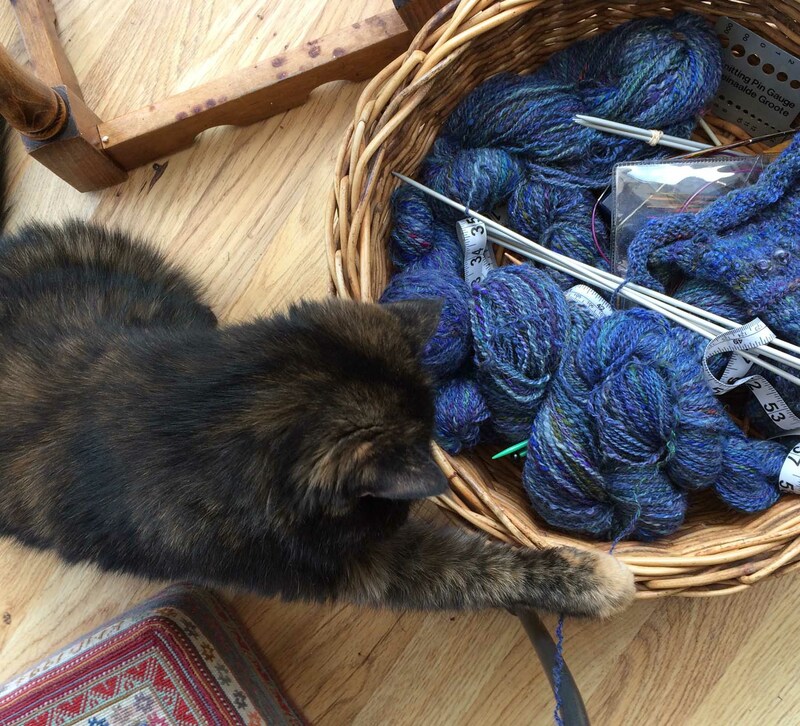 I even laugh when Eggy plays with my knitting wool! 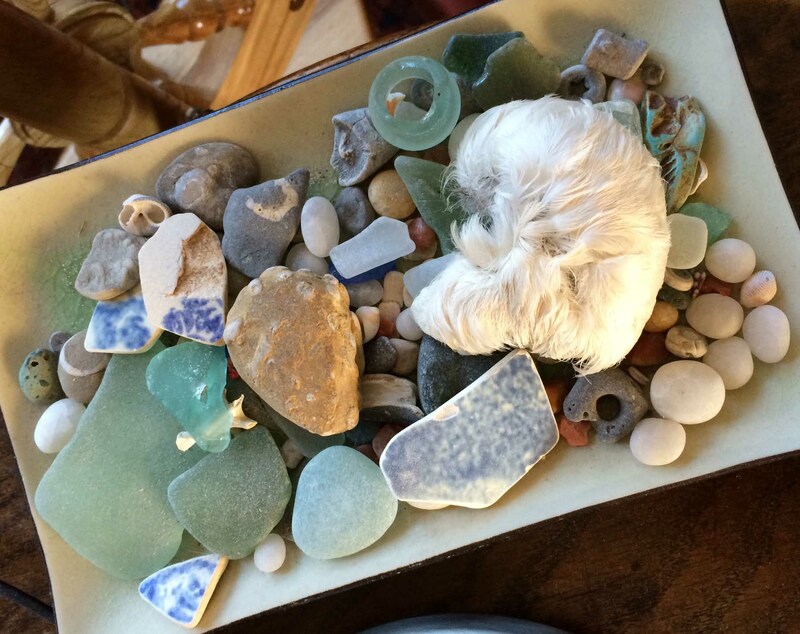 Among our collected bits and pieces from the seaside, we have what we think is an about-to-be-born seagull chick. It is just bones and feather (presumably the rest eaten by a predator). Ilsa loves it! 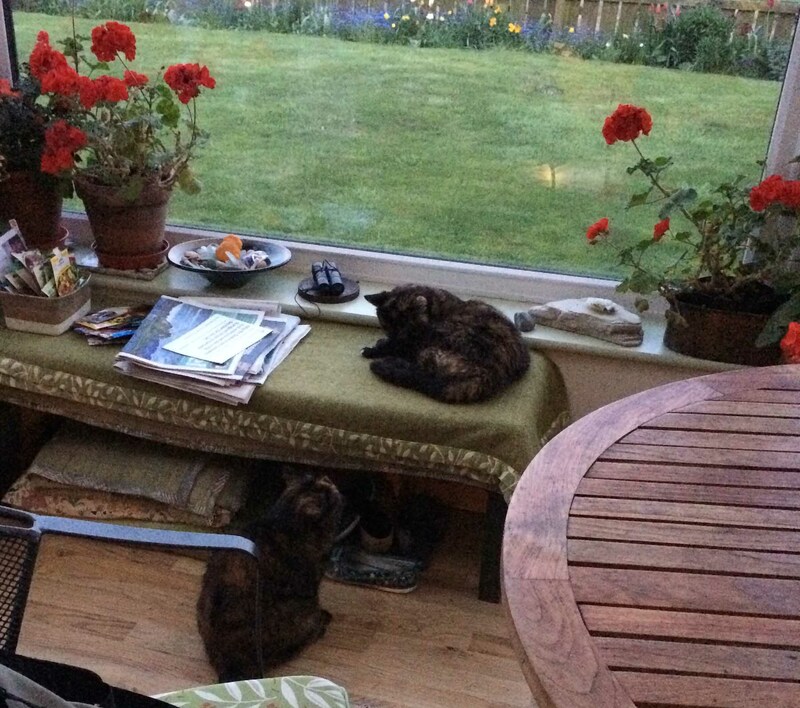 So Eggy and Ilsa have in their own ways made themselves at home. Meanwhile Poe is comfy as ever beside me on the sofa. 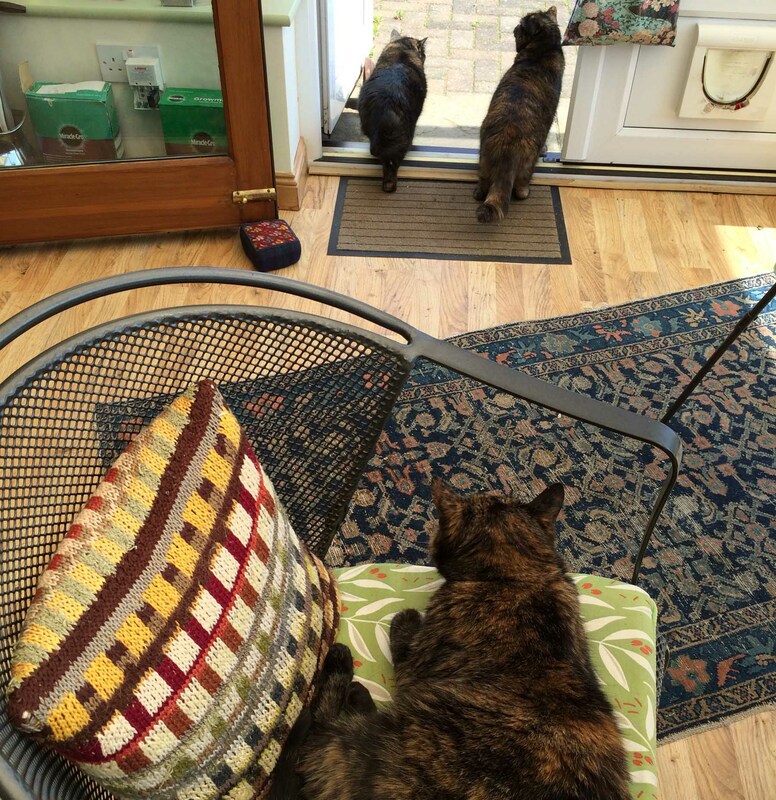 Three cats, getting on with their own lives, sharing the space. 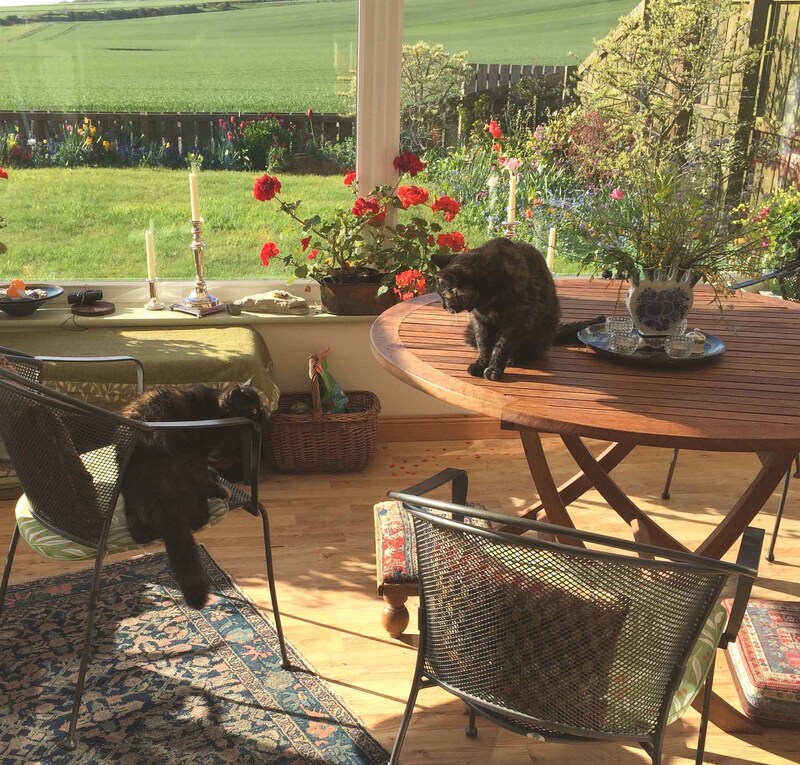 I don’t think they look a bit guilty for watching birds, and if all of their nine lives are half as comfy and entertaining as this one, they are in cat heaven! You have me chuckling! Yes, they are certainly well looked after – and all they have to do in return is provide entertainment! Isn’t it amazing how trying to keep up with a variety of pets can wear you out? But now it seems everyone is settling in to the new normal and you can enjoy seeing everything through fresh curious kitty eyes. I think Poe is beginning to realise that she is queen of the castle and far more important than the other two! Also perhaps nice for her to have cat company especially as they are lower down the hierarchy! This post was so entertaining! [J] This is such, such a delight! 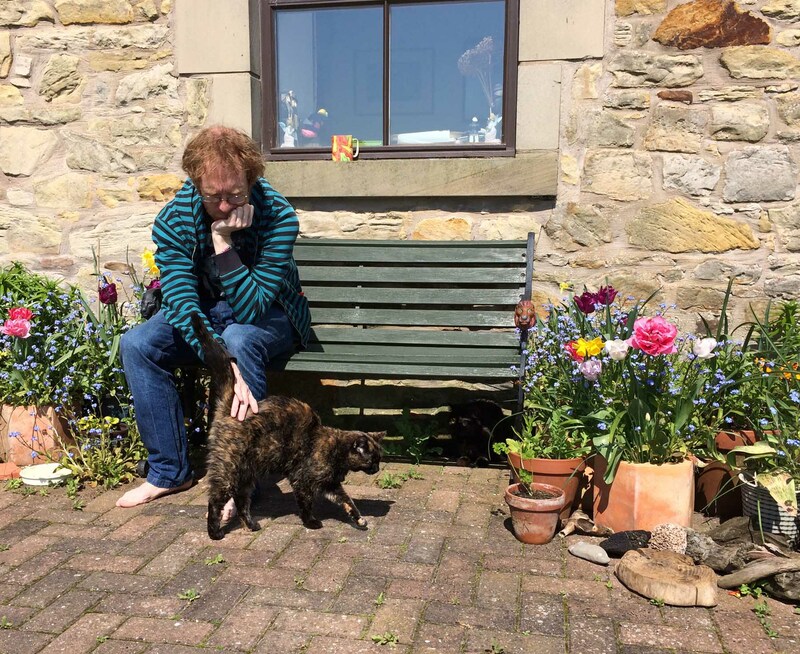 We went through all this ourselves a few years ago, when Molly’s sister died at about 14yrs old, and we wanted an apprentice cat (though eventually there were several!). Like Poe, Molly gradually learned to tolerate the upstart, and then slowly it became more than that: having the young ones about not only gave her a new interest in life, but actually seemed to give her a status she didn’t have before! 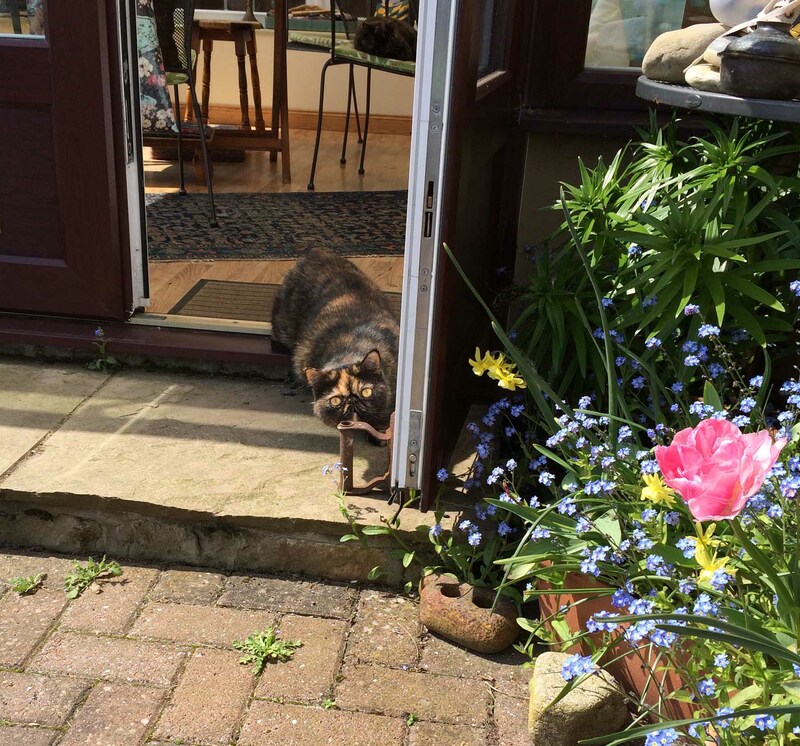 She’s now approaching 21, and still likes to go out for a walk around the house, and lets us know when she’s hungry, and she now has expensive and flighty tastes! But she is now as frail as she is dignified, and eating less and less, and sleeps more and more. 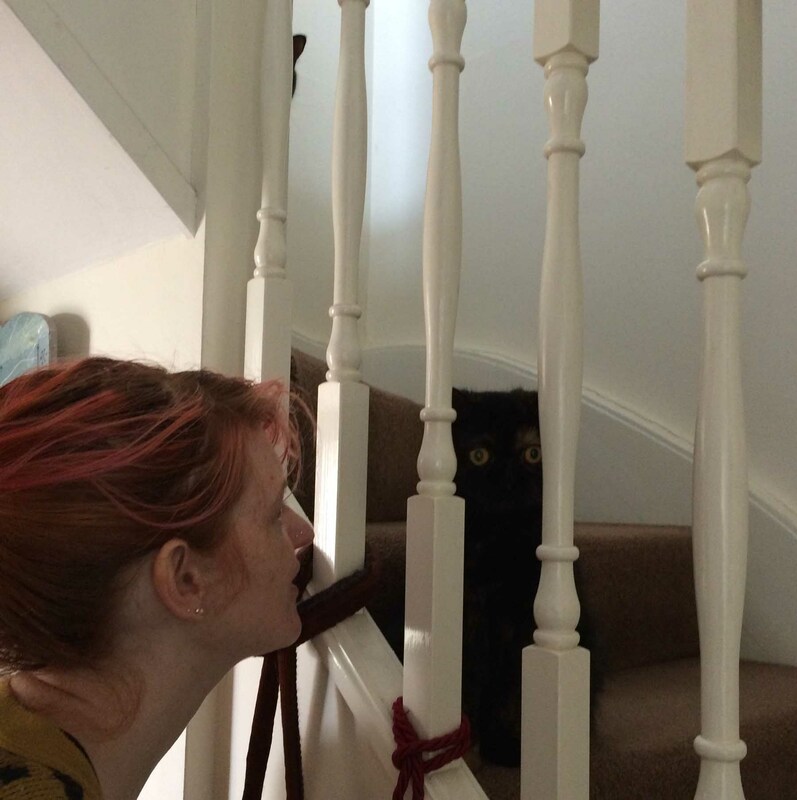 She doesn’t appear to be suffering – she purrs at the slightest provocation, so at present we’re hoping she will simply pass away in her sleep. Give Poe a loving stroke from Denise and I! 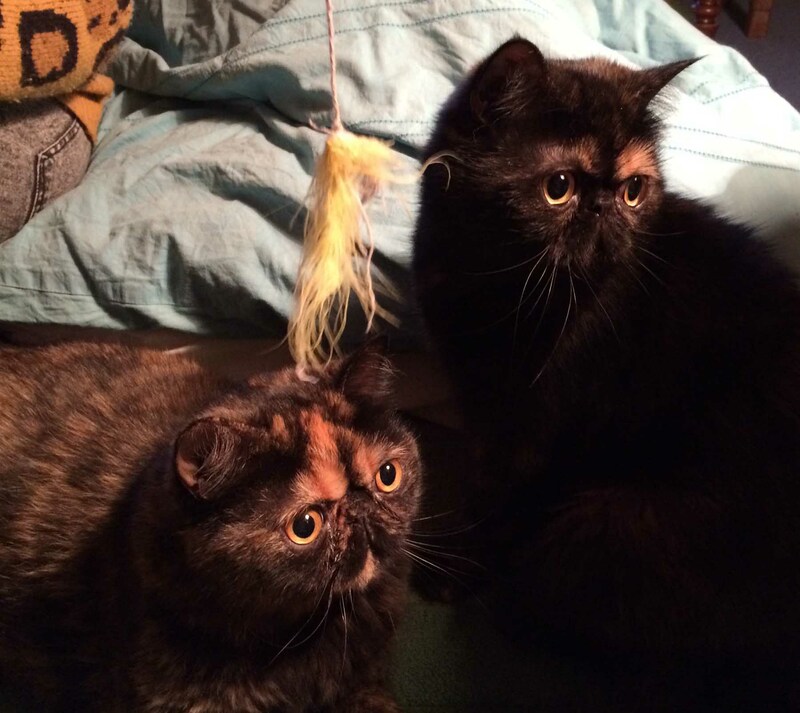 Thank you, Jonathan – and Poe (and the kits) send their furry purry best wishes to you both! 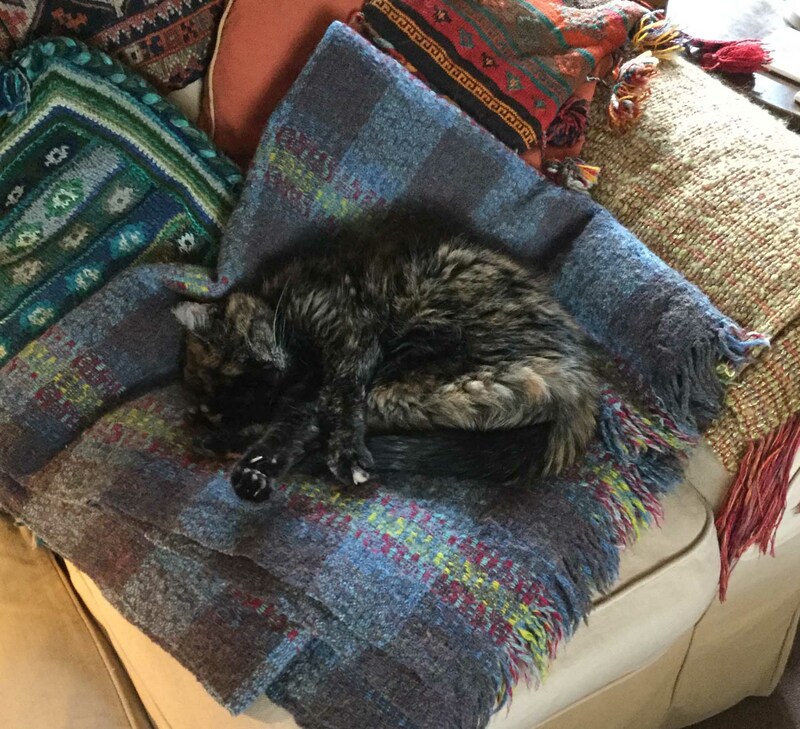 I am so impressed (and delighted) to hear that you have a nearly-21 year old cat, particularly because she sounds so similar to Poe in her aged delicate lifestyle (we also know about expensive and flighty tastes!) And I am also so very happy to hear that you too introduced an upstart, and life went as normal. Cats rule, OK! Aw, Poe! I’m so happy to read about a cat that’s here at the age of 19. My cat Squish is 15 and although still in relatively good health (he has hyperthyroidism) I often wonder how much longer we’ll have his company to enjoy. This gives me hope! I hope Poe and the newcomers manage to get along nicely. Here’s to a cozy furry existence between them all! My aged cat think he’s a teenager, though (or is a really randy senior!) He ehm, he likes to “go at it” with a teddy bear. Every. Day. 😳 Maybe that’s how he keeps his youthful attitude 😁 Say hello to Poe for me! That’s very funny – had me chuckling! Poe is long past such energetic pursuits …. So many thoughts….I like that you were thoughtful enough to take in 2 wee ones and yes, ‘they’ do sort themselves out! I had 2 cats that lived to be 21 and traveled back and forth across the US from coast to coast twice! I think younger animals tend to keep older ones interested in life a lot longer. They are beautiful cats……..Enjoy! Thank you! 🙂 🙂 Masks a multitude of gardening grubbiness!